Today, 10 December, is Human Rights Day, a celebration of the 1948 UN Universal Declaration on Human Rights. However, on this 10th day of December more people seem to have their eyes on the UN climate negotiations in Paris than are thinking about human rights. A disappointing draft agreement was published yesterday, and a revised draft is delayed this evening at the time of writing. Human rights don’t just exist on paper. Neither they nor climate change can they be considered in isolation from other issues. Human rights, environment, and economy are all intertwined. We people can make solutions harder to reach by slicing up our world into different disciplines: physics, ecology, economics, and law, for example. I recently spotted in a shop the ‘post capitalist Monopoly’ game. You might recall Monopoly, in which the objective is to amass wealth and bankrupt other players. (My sister was always amazingly good at this game – her tactic was to control the bank.) The ‘post-capitalist’ game apparently includes a player in the role of the government, putting brakes on the greed of the profit-oriented players. It assumes the rule of law, and the right of governments to control corporations (on behalf of citizens). This assumption does not hold true in many respects. So, in the current negotiations in Paris, the companies earning profit from the current status, the fossil fuel companies, are literally in the same room with the negotiators – and even in the centre of the room. The corporations are helping to set the international frameworks which should control their actions, and so it is not surprising that the agreements may not go far enough in exercising restraint in the name of the citizens. It is the citizens, after all, who may not be able to acquire food, or who may be subject to extreme storms, and experience the other impacts of climate change. The actions of corporations in relation to human rights and the environment are some of the major impacts of humans on our world. Corporations are huge ‘animals’ created by humans, which are then somehow seen as answering to a higher law, a law which might be described as ‘the economic imperative’. We could describe this imperative as one that claims that all good in society comes from economic growth, and therefore stimulating growth through encouraging economic activity, is inherently good. I am not at all quibbling with the concept that activity, productivity, a sense of meaningfulness, and exchange of goods, bring benefits to human society. The point on which I diverge, is the assumption that economic activity should be focussed only on increasing profit for shareholders. And that this animal should be left to exercise its own ‘nature’ without the tethers of the rule of law, such as pollution regulations or other standards. 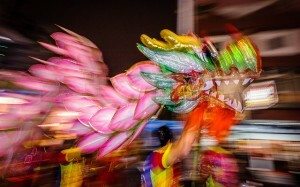 Like a dragon in a street parade, we must see past the huge animal and notice the many pairs of human legs powering it. And the human points of view powering the ‘imperative’. stabilization of greenhouse gas concentrations in the atmosphere at a level that would prevent dangerous anthropogenic interference with the climate system. Such a level should be achieved within a time frame sufficient to allow ecosystems to adapt naturally to climate change, to ensure that food production is not threatened and to enable economic development to proceed in a sustainable manner. Food production is already threatened; there is war in areas which have suffered unprecedented drought; and elsewhere there are floods and rain at the wrong time of year. A long-time climate scientist credited with bringing climate change to the US Congress’s attention 27 years ago in 1988, James Hansen, has proposed that price increases be applied to fossil fuels, and the proceeds be divided among all citizens. He reasons that the consumer would respond to the price of fossil fuels (now kept artificially low) and dividing the dividend among citizens would avoid political resistance to a fuel tax. His reasoning has merit, and it reaches to the heart of the problem. Subsidising fossil fuel companies is not a rational act on the part of anyone living in our world today. However, despite the creativity and merit of the idea, will it reach those cloistered in a negotiation room with representatives of the fossil fuel companies whose markets would be reduced under this scheme? Our economic model is focussed on gathering wealth for ourselves, a bit like a child collecting seashells on the beach, as many as he can carry. And yet Oxfam has pointed out that the wealthiest 10% of the earth produce 50% of the greenhouse gas emissions. Our society’s focus on economic growth (and measuring human well-being by per capita income, when in reality it encompasses much more than that) has narrowed our focus too much. It has created a conundrum. We assume that we must have more economic activity to be secure and happy. And yet, on many levels, increasing economic activity erodes the very well-being we aim to increase. Let me mention just two effects of increased economic activity which impact climate change: wealthier citizens eat more meat, using more land and producing more greenhouse gases than with other foods; and more energy is used – to produce fertilisers and packaging, transport goods, dispose of waste, mine raw materials, and simply to reflect the wealthier lifestyle with air conditioning, more cars, larger houses…. At the same time as negotiators have been gathering in Paris these two weeks, the UK has been slashing its own national support for alternative energy. And the EU continues to engage in negotiations to increase free trade, with the aim of increasing economic activity, although these trade agreements are projected to increase greenhouse gas emissions. These are good examples of the need to bring policy directions together into a coherent whole with a single set of compatible objectives. At the time of writing, I am greatly relieved to hear that the 1.5˚C target is back on the table in Paris, and that the very dangerous and less ambitious target of 2˚C was not necessarily the best countries could do. However, one big question, no matter what is agreed, is implementation. How will the words on the agreement be implemented, especially in the context of contradictory actions on free trade, on subsidising fossil fuels, and more, by the signatory governments?